Photographs by John Salmon, except where otherwise noted. The author would like to thank the kind person who opened the church for her just after it had closed for the day, and spent some time showing her round. This kind person had known a great sadness and evidently found consolation here — a reminder, in case it is needed, that churches are not museums or showpieces. You may use these images without prior permission for any scholarly or educational purpose as long as you (1) credit the person who took the photographs and (2) link your document to this URL in a web document or cite the Victorian Web in a print one. Click on all the images to enlarge them. 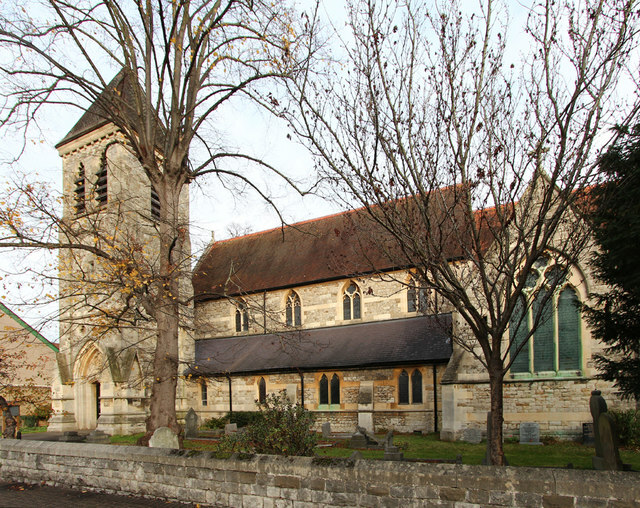 St Matthew's, Ashford, is one of the early, plainer churches by William Butterfield (1814-1900). Grade II listed, it was built from 11 July 1857, when the foundation stone was laid, to 1858, when it was consecrated on 26 June (see "History"), but its tower dates from 1865. It was built of ragstone with Bath stone dressings and bands, has red tiled roofs, and is in decorated Gothic style. The church is on the edge of town, on Church Street, Ashford. Left: The south-west entrance. Right: The length of the church, showing the south aisle and east window. The tower is at the south west, and has a pyramidal roof, but was not completed as Butterfield himself had intended (see Nairn et al., 97). 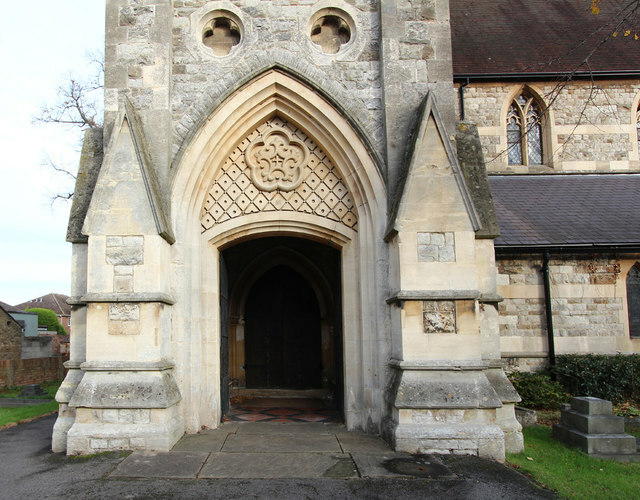 The porch below the tower, which provides the entrance, has a tympanum with geometrical carving and a central cinquefoil surrounding a tiny cross within Gothic patterning (this is very attractive, and is echoed in the carving of the pulpit; see below). The listing text draws attention to the two-light decorated clerestory windows, and the three-light east window, but the moist prominent window is the four-light west window. 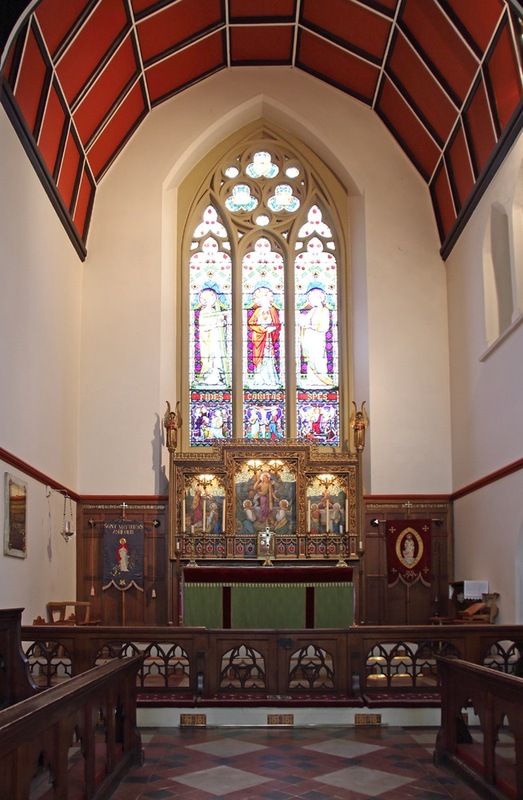 The parish history tells us that the vestry at the north-east was added in 1925, and eight of the windows were added shortly afterwards by the firm of William Aikman, adding to the impressive array of Victorian and early twentieth-century stained glass here. Left: View through the nave to the sanctuary. 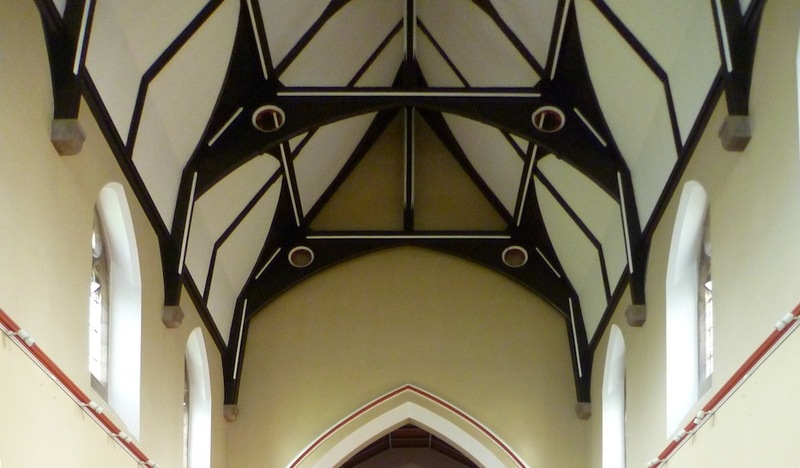 Right: Nave roof (photograph by JB). As seen above, the church's plan is conventional, with an aisled nave, a chancel and a small south chapel. It has been criticised as "uninteresting" (Stevenson 160), and as having "little to disclose the power of the designer of All Saints, Margaret Street, London" (Nairn et al. 97), but the roofs of both the nave and cancel express "the architect's delight in geometrical forms" (Stamp 93). Moreover, it is pleasant and suitable to its setting. It was a point of honour in this scrupulous architect to design appropriately and reasonably for the context. Paul Waterhouse writes, "He interested himself in the problem of providing cheap churches, and once designed a model church to cost £250. It was intended to be without porch or even pulpit, and the bell was to hang on a neighbouring tree." Fortunately, the amount at Butterfield's disposal here was considerably more (£4,300), most of it raised by the local Welsh School (later St David's School) and generous parishioners (see "St Matthew's Ashford"). 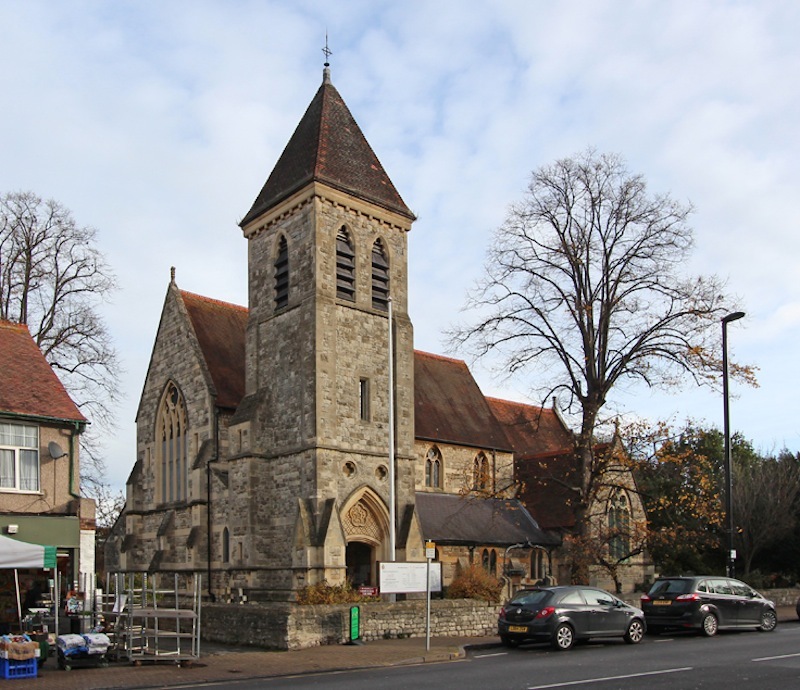 It is also worth noting that even the most celebrated architects built homely, unpretentious churches in small towns and villages — another example in Surrey is George Gilbert Scott's Holy Trinity Church, Westcott. Left: The chancel. Right: A closer view of the very beautiful reredos, its opus sectile work set off by golden mosaic skies, and focusing on the Resurrection. 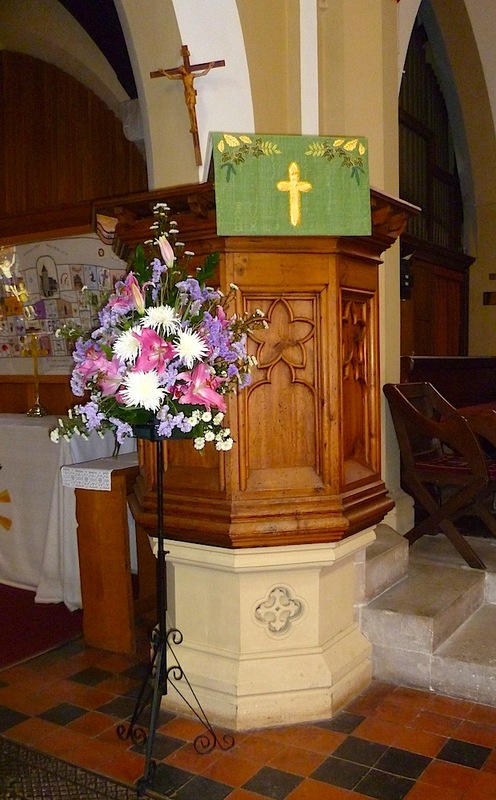 In the quieter context of a church like this, works of individual beauty stand out. 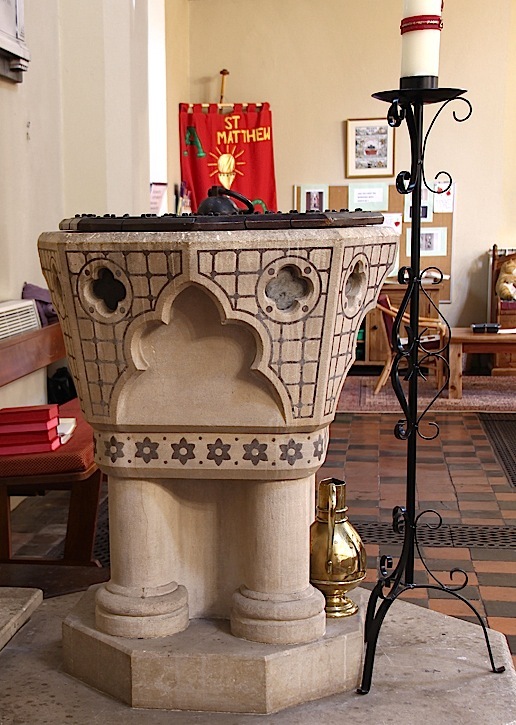 "The chancel furnishing and communion rail appear to be original Butterfield. 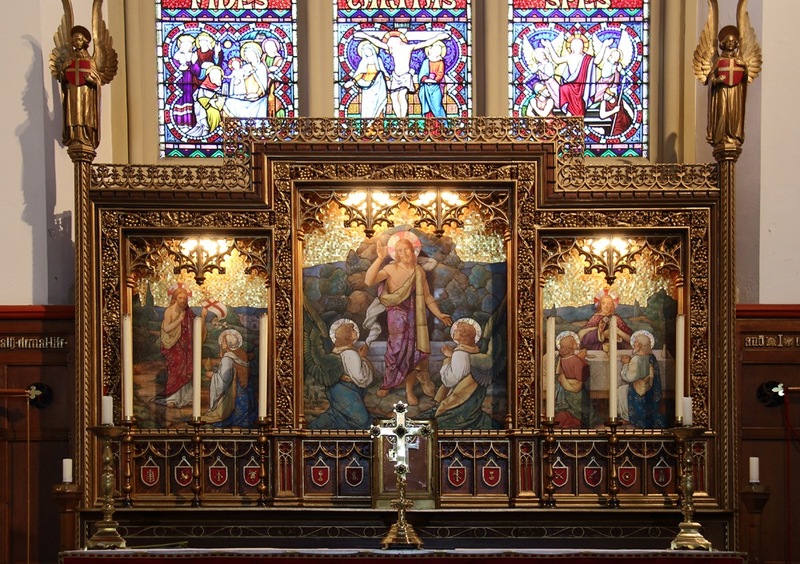 Of particular note is the Reredos, with ornate woodwork framing stoneware and mosaic picture panels" ("The Parish of St Matthew," 7). Rosemary Hill explains that by the late 1840s, Butterfield's career had been "well under way," and that, having been the de facto editor of the Instrumenta ecclesiastica, published by the Ecclesiological Society from 1847, he had regularly been publishing "his own designs for metalwork and furnishings" to some acclaim. The matching designs on the fitments are very pleasing. 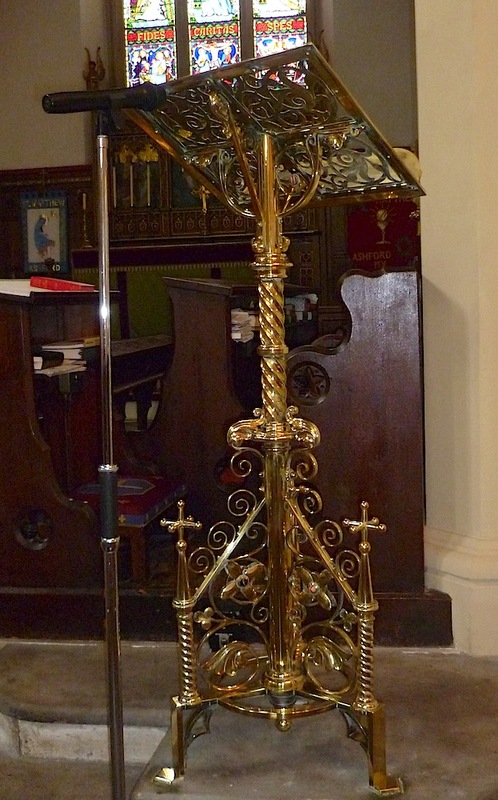 Behind the lectern can be seen the original choir stalls, also with a cinquefoil motif carving in the ends. 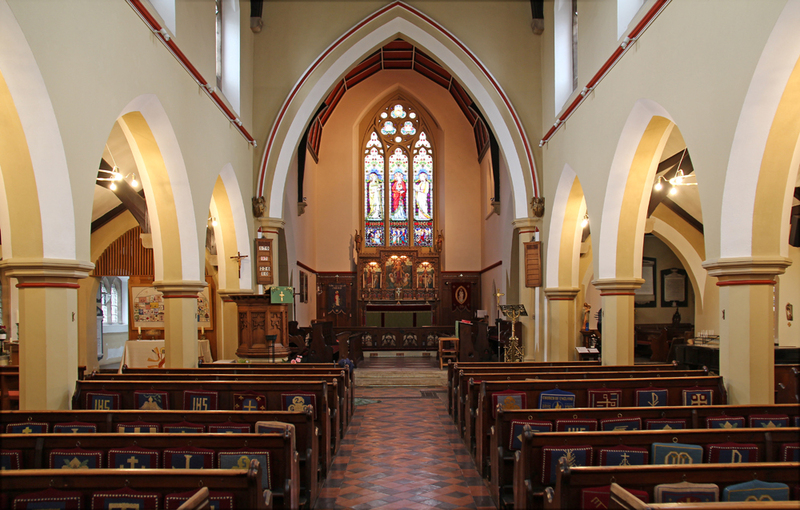 According to "The Parish of St Matthew," only the north aisle has modern pews (7). 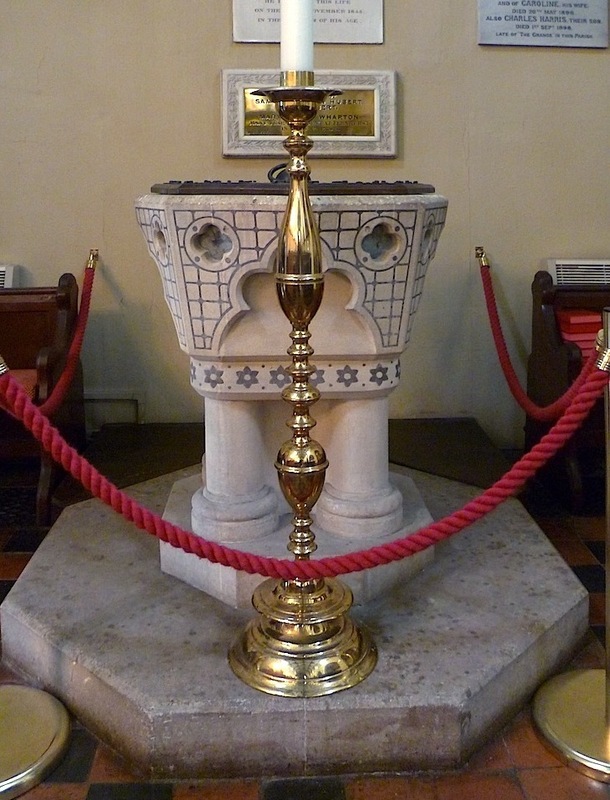 View of the font form the side, showing a different candle-holder. Stained glass here by Hardman & Co.
"St Matthew's Ashford: History of the Parish." St Matthew's Ashford. Web. 8 March 2017. Nairn, Ian, and Nikolaus Pevsner, rev. 2nd ed. by Bridget Cherry. Surrey. London: Penguin, 1971. Eberhard, Robert. "Stained Glass Windows at St Matthew, Ashford, Surrey" Church Stained Glass Windows. Web. 1 July 2015. Hill, Rosemary. "Butterfield, William (1814-1900), architect and designer." Oxford Dictionary of National Biography. Online ed. Web. 1 July 2015. Page, William, ed. "Spelthorne Hundred: Ashford." In A History of the County of Middlesex: Volume 2. London, 1911. British History Online. Web. 8 March 2017. Parish Church of St Matthew, Ashford. British Listed Buildings. Web. 8 March 2017. The Parish of St Matthew, Ashford, Middlesex." Web. 8 March 2017. Stamp, Gavin. "The Cathedral of the Isles." Howell and Saint 83-95.